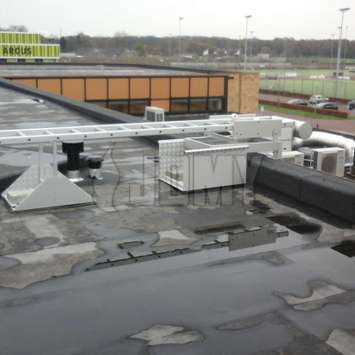 For roofs, platforms and flat surfaces. Smart and inexpensive alternative for egress or access. 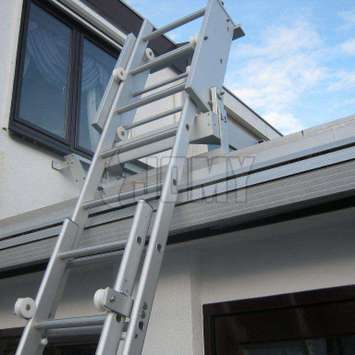 Burglar-resistant: ladder is hidden on the roof and slides out smoothly to reach level below. Creates a clutter-free zone, ideal for saving space. For heights of up to 6m. 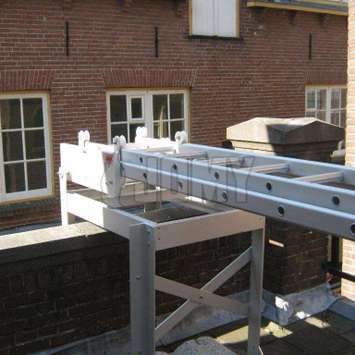 The JOMY rooftop gliding ladder is the smart and inexpensive solution for emergency evacuation or access from a flat roof surface with a maximal height of 6m. 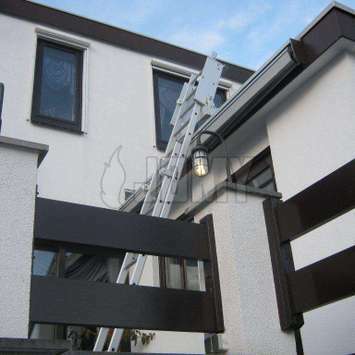 This is the ideal substitute when a neighbor doesn't give permission for a fixed ladder in the driveway or there simply isn't enough available space for one. 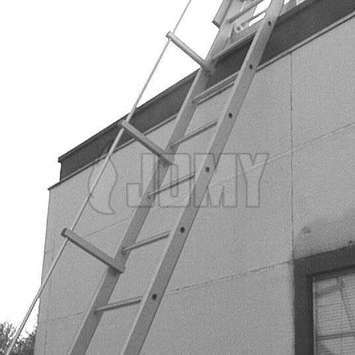 The JOMY rooftop gliding ladder is easy to install and inexpensive. 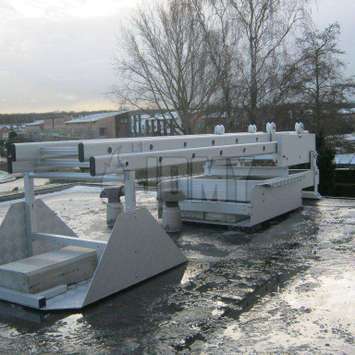 JOMY's aluminum rooftop gliding ladders are installed on top of flat roofs with a maximum height of 6m. They are held in place by concrete blocks. 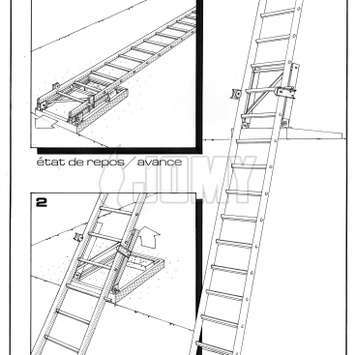 The ladders consist of two parts. When needed, the lightweight aluminum ladder is easily slid out beyond the roof edge until the blocking is reached. 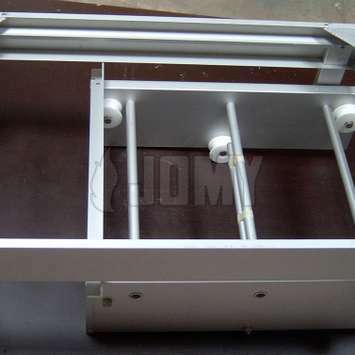 The ladder then glides automatically towards the level of escape. 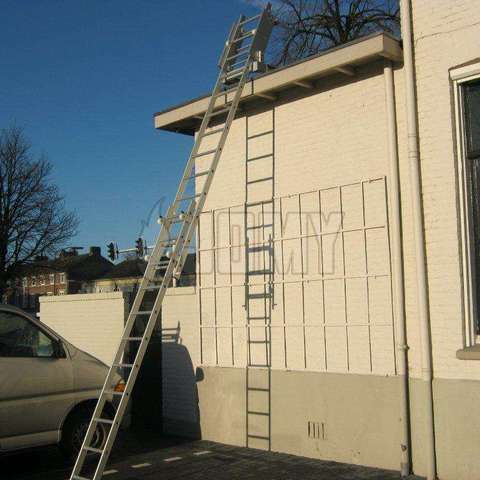 This ladder is a safe, reliable, and stable evacuation route. It's also easy to install with limited investment. 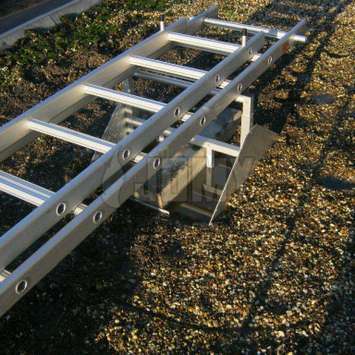 Rooftop gliding ladders have two parts: a frame and a ladder. 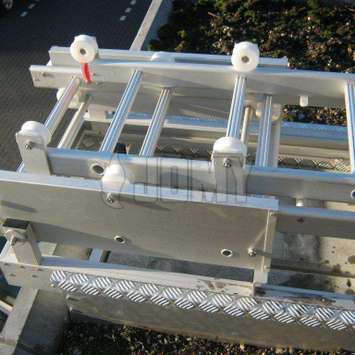 Both parts are constructed from extruded anodized aluminum profiles with stainless steel fasteners. The ladder uprights are spaced at 435mm, and the rung axes are at 282mm. Blocking protects against unauthorized removal from frame. 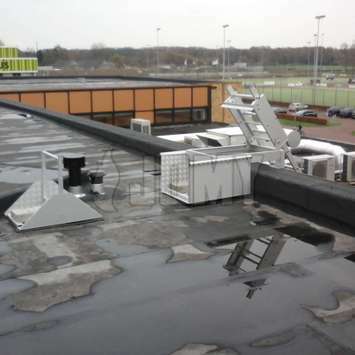 When slid beyond the roof edge as far as the blocking, the ladder automatically balances in the required position and offers all individuals a safe escape or access route.